…in this instance, a Californian boy and a Sussex girl living in the Midwest, US. When you live in Car Culture, USA, public transport is not only a greener alternative to driving, but also something of a novelty, so when we decided to spend a month in Spain, we looked for a home base where we could get around without signing our retirement investments over to Hertz or Avis. More remote locations tempted us, but if we were going to be car-free, we would need easy access to a market, shops, and, of course, a variety of tapas options. That is how we landed in Órgiva. 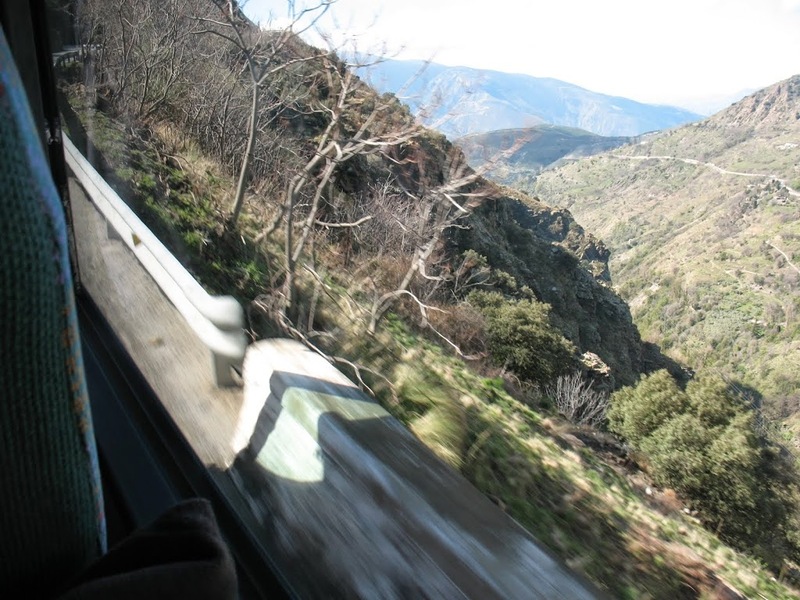 From Madrid, we took the bus to Granada, made an easy transfer, and headed to Las Alpujarras along a sinuous mountain route. As we descended into Órgiva, our first view of the church welcomed us. Because we had eagerly followed this blog throughout a frigid winter, the twin towers already seemed like old friends. The town residents were even out in full force, pouring en masse down the Calle Dr. Fleming. Actually, they were marching against cancer, but it made for a lively greeting. Life in Órgiva soon took on a pleasant rhythm—a day of adventure followed by a day of reading and putzing around. 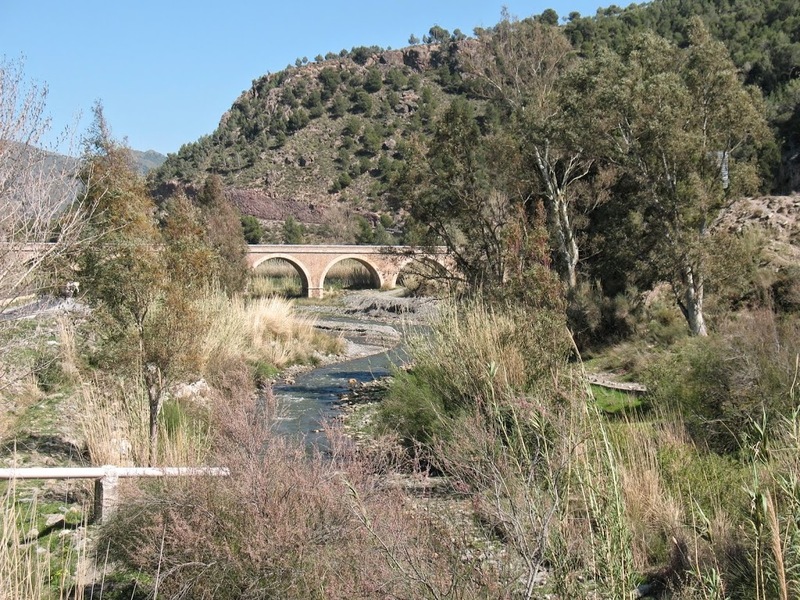 We went on all the walks featured on this blog, following the acequia to Bayacas as well as the two loops to the Rio Guadalfeo. On many sunny evenings we enjoyed the newly signposted Ruta Olivos Centenarios. Turning sharp left shortly after El Molino Benizalte, the lane winds downhill, passing ancient gnarled trees, scarred from years of aggressive pruning. 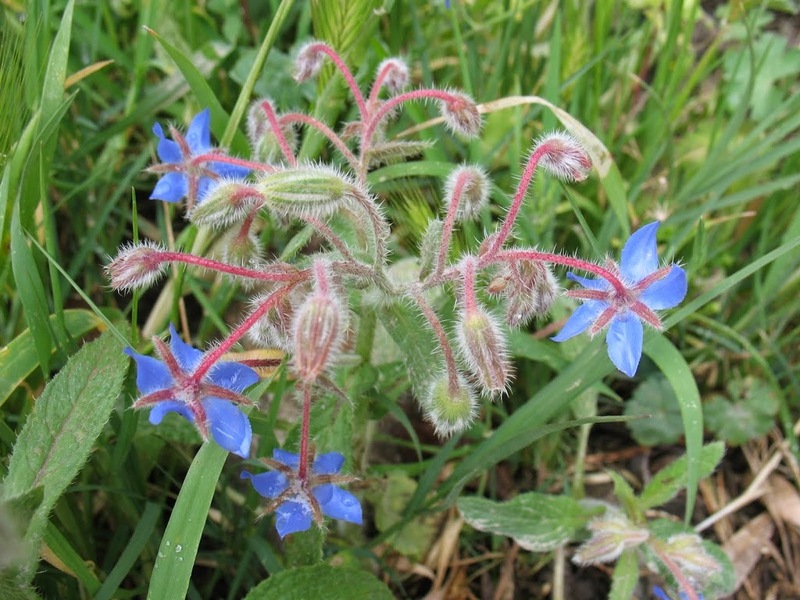 The Sierra de Lújar forms a dark backdrop to buttery oxalis, scarlet poppies, and (putting us in the mood for a Pimms or a G & T) sky-blue stars of borage. 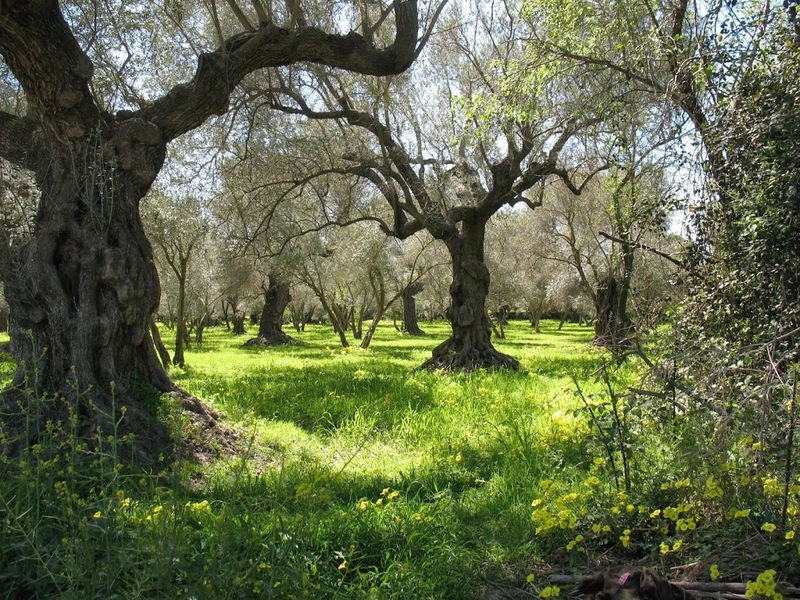 A twittery chorus of sibilant serins flitters among the olive and orange groves, yellow rumps flashing. Eventually the path reaches the river, a good place to pause before the steady climb back to town. Here, close to the Puente de los Siete Ojos, we witnessed an avian spa as pairs of goldfinch, blackcaps, Sardinian warblers, and collared doves took turns rinsing off the dust and sipping water from a pool among the rocks. Walking directly out of Órgiva kept us busy, but the Alhambra definitely beckoned*, and several buses leave daily, so we took two trips to Granada. We avoided the bus station on the northern outskirts, and saved time, by getting off just past the science museum at the ‘helicopter roundabout’ and walking to the city centre. No parking hassles, and somebody else navigated those switchback mountain roads. Along the way, we gazed at the views and practiced our Spanish by shamelessly eavesdropping on animated—and loud—passenger conversations. The even more vertigo-inducing bus to the white villages runs three times a day, allowing time for a decent walk and a recuperative drink and tapa. 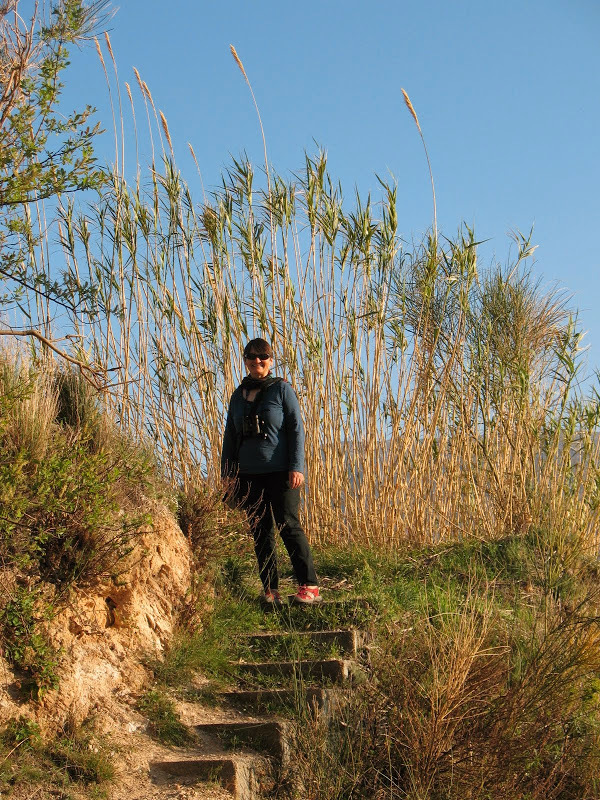 The first time, we got off in Pampaneira and walked uphill to Bubión and Capileira; the second time, feeling less energetic, we got off in Capileira and walked the route in reverse. Finally, we ventured further away to Pitres, the less touristy starting point for a choice of walks described by Charles Davis in Walk! The Alpujarras. 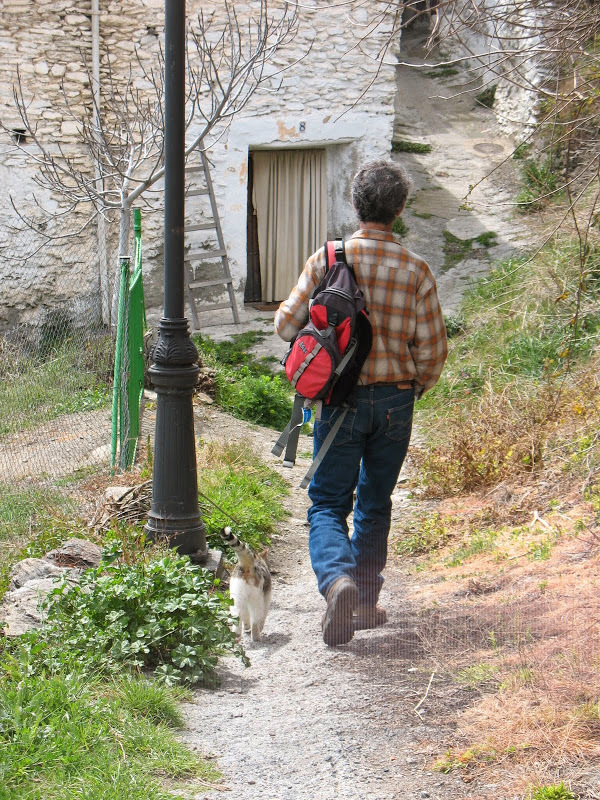 The circular ‘Balcón de Pitres’ route climbs through a woodland gully, echoing with warblers and finches, to the picturesque hamlet of Capilerilla. It then meanders through an elderly chestnut wood before opening up to a track with splendid views across Pitres, now far below, to the Sierras Mecina and Contraviessa. Here we ate our picnic lunch while a booted eagle dive-bombed for its prey. Finally, the path descends back to the peaceful plaza in Pitres, where yet more wine and tapas at a friendly cafe refreshed our creaky joints. Lanjarón also offers a choice for car-free walkers. 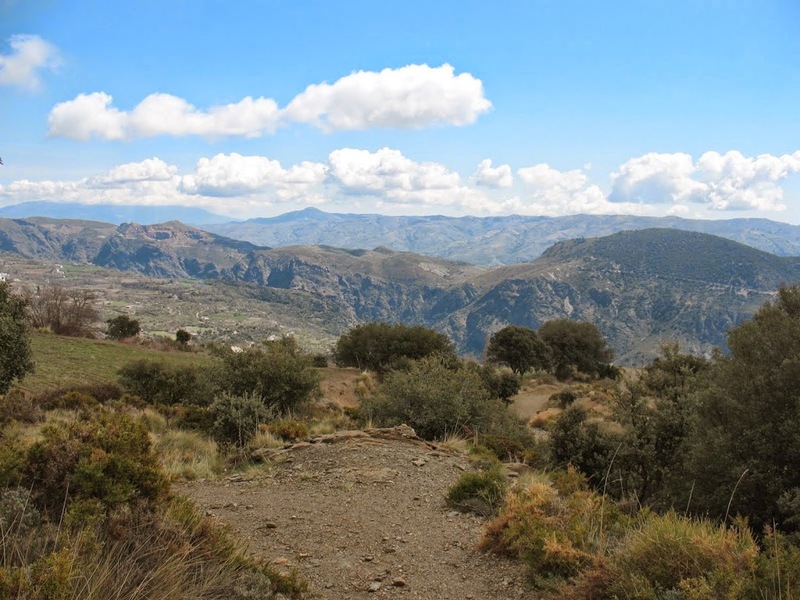 Either take the bus in both directions and complete the loop that Charles Davis calls “Sendero Circular de Lanjarón,” or do as we did, and follow con jamon spain‘s route from the BP station in Órgiva up and across the hills, taking the bus back. More scrambling uphill means more splendid views, followed by lunch in their favourite ham shop. Well, actually we got lost and the ham shop was being renovated, but we still had a great time and made it to Lanjarón. No matter—it just means we have to come back to get it right and indulge in the jamon. Craving a dose of salt air, which this California boy and Sussex girl miss living in the Midwest, we had hoped to explore the coastal towns of Almuñécar and Nerja. Although a daily bus heads to the coast, it stops at Motril for twenty minutes, making the journey a bit too long for a day trip. However, the same bus continues all the way to Málaga, providing a useful daily connection to the airport. And, in typical friendly Órgiva fashion, and thanks to our landlords, we got a seaside paddle and sand between our toes anyway—the only time we were in a car in almost a month. If we had hired a car we would have ventured further afield, seen more famous sights, but we have no regrets. Roughly speaking, the cost of all our bus fares, including from Madrid and to Málaga, came to less than €120. Today Europcar is quoting €443 to squash yourself into an economy car for three weeks, and that’s before petrol and additional options. We saved a lot of money, reduced our carbon footprint, mixed more with the community, and – best of all – didn’t drive off a mountainside. * While it’s advised on a million websites that ‘booking is essential’ to go to the Alhambra, Ed and Charlotte turned up early without a ticket and got into the whole thing. It wasn’t high season though. Still, it can be done. OH I’m so glad you enjoyed taking public transport for a change, Ed and Charlotte – you certainly picked a spectacular place to spend your time in Spain. Hi Marianne – if Ed and Charlotte return (which we really hope they do), and we have a car, we’ll taxi ’em over! Thanks everyone for all the offers. One of us turned 65 in Orgiva, so retirement with all its flexible time is on the horizon. We have to come back while we can still stagger up a hill. Just re-read this post in anticipation. Don’t worry–we won’t hold you to taxi service!